Watch one movie a day and book tickets for 4 movies (4 tickets) within 30 days from the purchase date. Know More. Watch one movie a day and book tickets for 3 movies (3 tickets) within 30 days from the purchase date. Know More. Watch one movie a day and book tickets for 4 movies (16 tickets) within 30 days from the purchase date. Know More. Watch one movie a week and book tickets for 4 movies (4 tickets) within 30 days from the purchase date. Know More. Watch one movie a week and book tickets for 4 movies (8 tickets) within 30 days from the purchase date. Know More. Watch one movie a week and book tickets for 12 movies (24 tickets) within 90 days from the purchase date. Know More. Buy a MOVIEPASS to get your unique code. This unique code will be automatically available for 30 days, on your next 4 movie bookings. You will get cashback within 72 hours on tickets booked through MOVIEPASS unique code. You can book any number of tickets with this Pass (max 10), but Rs.100 cashback per ticket will be credited only for 1 ticket per booking. Movie Pass can be purchased only on the TicketNew app. Movie Pass is non-transferable and is to be used by the registered TicketNew account holder. Convenience fees, 3D glasses or any entertainment or government taxes will be charged additionally and are not a part of the offer under this campaign. 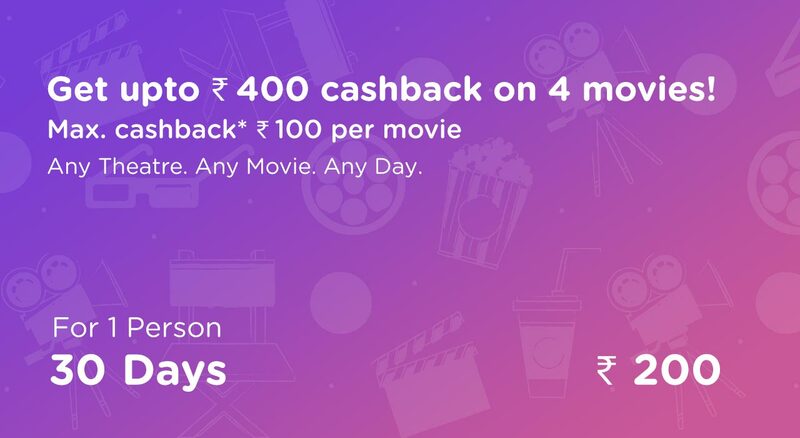 Use your unique code to get Rs.100 Cashback on the ticket price of 1 movie ticket. Promocode received is valid for 30 days from the date of purchase & is only applicable for booking movie tickets on TicketNew website, mobile site and app. 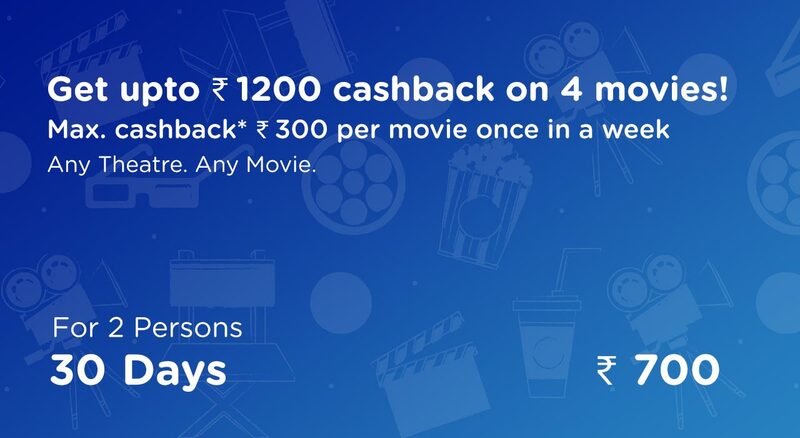 Cashback will be credited in your Paytm wallet within 72 hours of booking movie tickets. Movie Pass once purchased cannot be cancelled. Only one Movie Pass can be purchased by a registered user at a time. User can buy his next pass upon expiry of his current Movie Pass. TicketNew Movie Pass is meant for booking tickets for individual/personal consumption only. In case it is used for re-selling of tickets or commercial purposes, TicketNew reserves the right to cancel the Movie Pass. Upon cancellation of shows, the pass usage against cancelled tickets will be reset and can be utilized within the expiry date. Buy a MOVIEPASS to get your unique code. This unique code will be automatically available for 30 days, on your next 3 movie bookings. You will get cashback within 72 hours on tickets booked through MOVIEPASS unique code. You can book any number of tickets with this Pass (max 10), but 50% cashback up to Rs.100 per ticket will be credited only for 1 ticket per booking. The ‘Movie Pass’ holder is entitled to watch one movie a day and book tickets for up to 3 movies within 30 days of the purchase date. 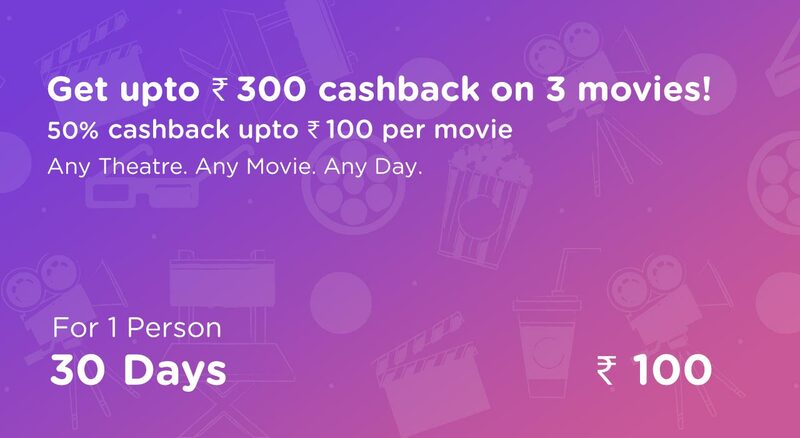 Use your unique code to get 50% cashback upto Rs.100 on the ticket price of one movie ticket. Promocode received is valid for 30 days from the date of purchase & is only applicable for booking movie tickets on TicketNew website, mobile site and app. Buy a MOVIEPASS to get your unique code. This unique code will be automatically available for 30 days, on your next 4 movie bookings. You will get cashback within 72 hours on tickets booked through MOVIEPASS unique code. You can book any number of tickets with this Pass (max 10), but Rs.120 cashback per ticket will be credited only for up to 4 tickets per booking. 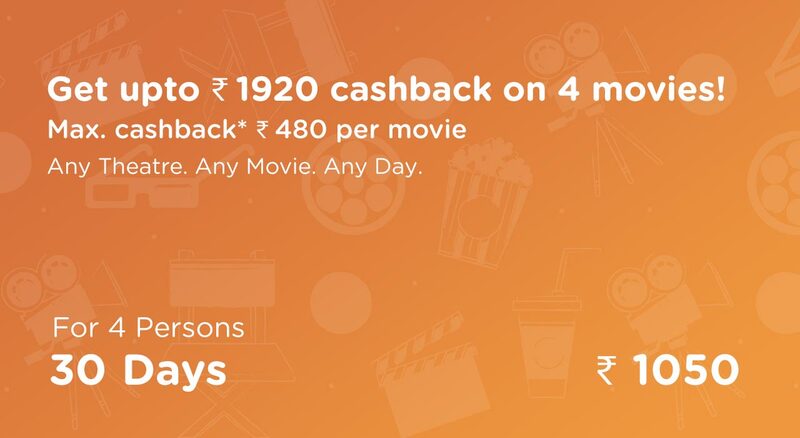 Use your unique code to get Rs.120 Cashback on the ticket price of four movie tickets. Promocode received is valid for 30 days from the date of purchase & is only applicable for booking movie tickets on TicketNew website, mobile site and app. Buy a MOVIEPASS to get your unique code. This unique code will be automatically available for 30 days, on your next 4 movie bookings. You will get cashback within 72 hours on tickets booked through MOVIEPASS unique code. You can book any number of tickets with this Pass (max 10), but Rs.150 cashback per ticket will be credited only for 1 ticket per booking. The ‘Movie Pass’ holder is entitled to watch one movie in a calendar week and book tickets for up to 4 movies within 30 days of the purchase date. 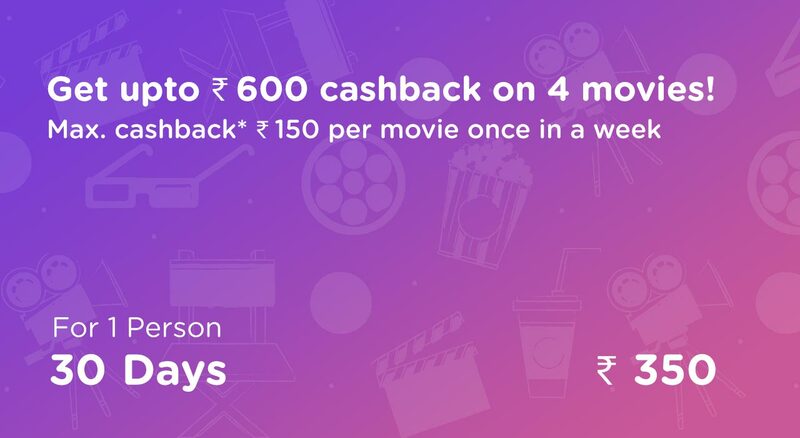 Use your unique code to get Rs.150 cashback on the ticket price of one movie ticket. Promocode received is valid for 30 days from the date of purchase & is only applicable for booking movie tickets on TicketNew website, mobile site and app. Buy a MOVIEPASS to get your unique code. This unique code will be automatically available for 30 days, on your next 4 movie bookings. You will get cashback within 72 hours on tickets booked through MOVIEPASS unique code. You can book any number of tickets with this Pass (max 10), but Rs.150 cashback per ticket will be credited only for up to 2 tickets per booking. Use your unique code to get Rs.150 cashback on the ticket price of two movie tickets. Promocode received is valid for 30 days from the date of purchase & is only applicable for booking movie tickets on TicketNew website, mobile site and app. Buy a MOVIEPASS to get your unique code. This unique code will be automatically available for 90 days, on your next 12 movie bookings. You will get cashback within 72 hours on tickets booked through MOVIEPASS unique code. You can book any number of tickets with this Pass (max 10), but Rs.150 cashback per ticket will be credited only for up to 2 tickets per booking. The ‘Movie Pass’ holder is entitled to watch one movie in a calendar week and book tickets for up to 12 movies within 90 days of the purchase date. Use your unique code to get Rs.150 cashback on the ticket price of two movie tickets. Promocode received is valid for 90 days from the date of purchase & is only applicable for booking movie tickets on TicketNew website, mobile site and app. The most anticipated chapter in the Marvel Cinematic Universe is waiting to unfold this April 26 and we have an equally exciting treat for every Marvel fan- the Avengers Exclusive Offer. Get your exclusive offer and watch the movie for just Rs. 99. Buy now on TicketNew and get 100% Cashback* up to Rs. 250 on movie tickets. Hurry, it’s time to be ready for the final standoff against the greatest villains the Avengers have ever faced. Minimum 2 tickets have to be purchased with this offer. This offer is applicable on cinema PAN India available on TicketNew. The offer is only applicable on 'Avengers Endgame’. The offer is Non-transferable and is to be used by registered TicketNew users only. One user will be able to use one pass at a time only. Upon cancellation of tickets purchased using the exclusive offer, the pass usage against cancelled tickets will get reset and can be used against your next Avengers booking within the valid period. The most anticipated chapter in the Marvel Cinematic Universe is waiting to unfold this April 26 and we have an equally exciting treat for every Marvel fan- The Avengers Exclusive Offer. Get your exclusive offer and watch the movie for just Rs. 49. Buy now on TicketNew and get 25% Cashback* up to Rs. 300 on two movie tickets. Hurry, it’s time to be ready for the final standoff against the greatest villains the Avengers have ever faced. Minimum 2 tickets have to be purchased with this exclusive offer. ‘TicketNew Avengers Exclusive Offer’ entitles the user to watch Avengers: Endgame till 30th June 2019. Use your unique code to get 25% Cashback* up to Rs. 300 on booking minimum 2 tickets. If you book 2 tickets worth Rs. 250 each, you will get total Rs. 125 Cashback. If you book 2 tickets worth Rs. 400 each, you will get total Rs. 200 Cashback. If you book 3 tickets worth Rs. 400 each, you will get total Rs. 300 Cashback. The most anticipated chapter in the Marvel Cinematic Universe is waiting to unfold this April 26 and we have an equally exciting treat for every Marvel fan- The Avengers Exclusive Offer. Get your exclusive offer and watch the movie for just Rs. 9. Buy now on TicketNew and get flat Rs. 100 Cashback* on movie tickets. Hurry, it’s time to be ready for the final standoff against the greatest villains the Avengers have ever faced. There is no minimum order value to use this exclusive offer. ‘TicketNew Avengers Endgame Exclusive Offer’ entitles the user to watch Avengers: Endgame till 30th June 2019. Use your unique code to get flat Rs. 100 Cashback* on booking 2 tickets for the movie. If you book 2 tickets worth Rs. 250 each, you will get total Rs. 100 Cashback. If you book 3 tickets worth Rs. 250 each, you will get total Rs. 100 Cashback. This offer is applicable on cinemas PAN India available on TicketNew. Promo code received is valid till 30th June 2019.